Pie or tart is pretty much the same thing, right? What is different in this case is the filling. 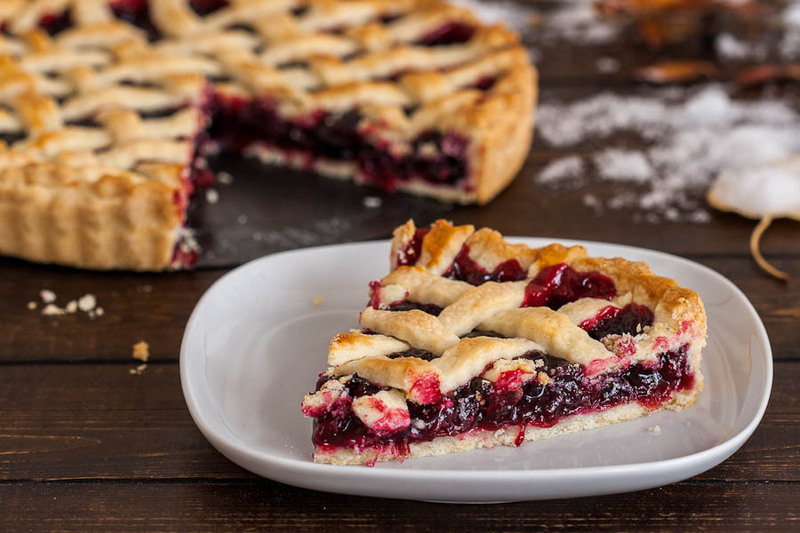 I know everybody loves berries to some degree but personally I never thought of mixing cranberries and blueberries in a dish, especially in a pie. Well, the result was… fantastic. Probably one of the best pies/tarts that I’ve ever had, at this point I don’t even like the apple pie anymore, it’s that good. Unfortunately no one can be told how good my tart is, you have to bake it yourself. Start by placing the butter in your freezer for about 20 minutes. Meanwhile add the flour, salt and sugar to your food processor and mix it for a couple of times. Take out the frozen butter and add it to the food processor, over the flour thing, and give a couple of short swirls until the mixture resembles peas. Start pouring the ice water, one tablespoon at a time and continue those short swirls until the dough starts holding together. Remove the dough from food processor and place it over your working surface. Form the dough into 2 discs, cover in plastic wrap and refrigerate for at least one hour up to 2 days before using ( I would go for one day at least). Now, preheat oven to 425° F / 220° C. Coat a tart dish plate with nonstick baking spray and set aside. Place the fruits in a large bowl and set aside as well. In a small bowl combine brown sugar, cornstarch, orange zest and extract; mix well. Pour everything over the big bowl of fruits and toss to coat. Take out the pastry discs from the fridge and roll out a disc so that it’s 12in (30cm) in diameter and place it and arrange in your tart/pie dish. Brush the pie crust with egg white so that it doesn’t get soggy then pour the fruits mixture inside. Roll out the other disc so that it’s 12in (30cm) in diameter as well and cut it into lattice strips. Arrange the lattice strips nicely over the berries and brush with remaining egg white. Bake for 45 minutes or until golden brown. Let it cool before serving. If you don’t feel tempted after seeing my pictures then you definitely don’t know what you’re missing, beats apple pie any day. Have fun! In a food processor add the flour, salt and sugar and give it a swirl for a couple times. Add the butter and again give it a couple of short swirls until the mixture resembles peas. Add the ice water, one tablespoon at a time and continue mixing. The dough should start to hold together. Preheat oven to 425° F / 220° C. Coat a tart dish plate with nonstick baking spray. Place the fruits in a large bowl. In a small bowl combine brown sugar, cornstarch, orange zest and extract; mix well. Add to your fruits; toss to coat. Take out the pastry discs from the fridge and roll out a disc so that it’s 12in (30cm) in diameter and place it and arrange in your tart/pie dish. Brush the pie crust with egg white so that it doesn’t get soggy. Roll out the other disc so that it’s 12in (30cm) in diameter as well and cut it into lattice strips. Arrange the lattice strips nicely over the berries and brush with remaining egg white. Bake for 45 minutes or until golden brown. Let it cool before serving. That tart is beautiful! I love how the crust looks! Cranberries and blueberries sound like a great combo. Hey there! 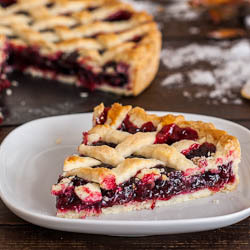 I found your beautiful pie recipe off of foodgawker.com and am making it right now using blackberries and blueberries instead of cranberries. I will let you know how it turns out and send you photos if you are interested :) Thank you for this recipe! Hey! Can you tell me why you use frozen butter and ice cold water for the pie crust? The tart looks beautiful, thanks! It’s about not melting the fat too fast before you can cut it into the flour. This helps to keep the crust flaky. When the lumps of fat melt in the oven, they create steam, which helps to separate the crust into multiple flaky layers. If it melts before that, no steam and you get a hard, crunchy crust instead of a nice tender flaky crust. What size tart pan did you use?